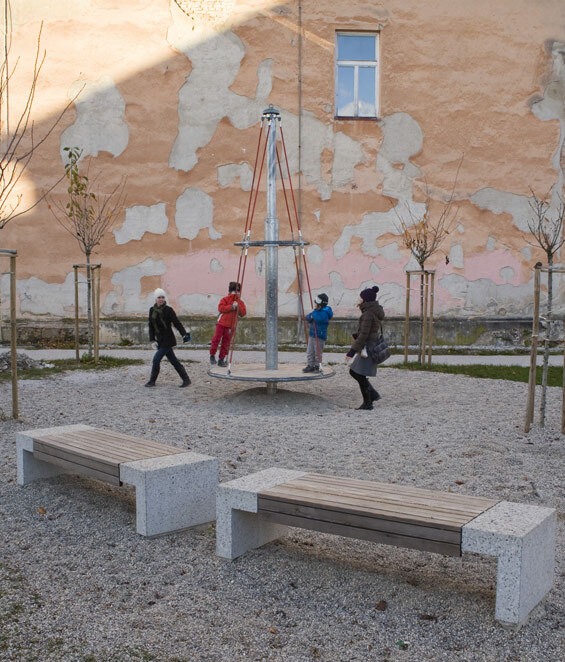 HomeGENERALDesignKranj old city centre renewal | Kranj Slovenia | Luz, d.d. The winning competition project proposed to reveal, highlight and subtly upgrade an array of unique elements of urban and natural heritage in the nowadays image of the city. The new design aimed to increase representativeness and to create a good basis for a comprehensive revitalisation of public space. 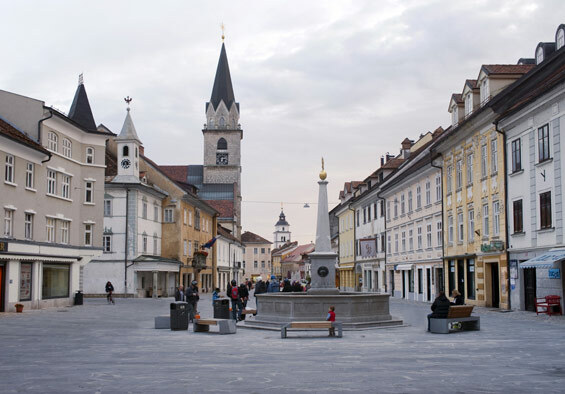 Kranj is the fourth largest city in Slovenia, situated in the northwest subalpine part of the country. On the conglomerate pier rising above the confluence of two Alpine rivers Kokra and Sava, archaeological evidence of settlements from as early as the iron age has been found. The relationship between the introverted medieval core and the enclosing wild nature of both river canyons, maintains a strong contrast even today. The city itself has developed over thousands of years. Remains of different periods were layered on top of one another, assembling the complex puzzle we see today. The prevailing medieval setting is hosting remains of Hallstatt, Illyrian, Celtic, Roman and Lombard structures. Nowadays mainly industrial city has long outgrown its medieval frames, and is facing the problem of abandonment and degradation of its historic core. 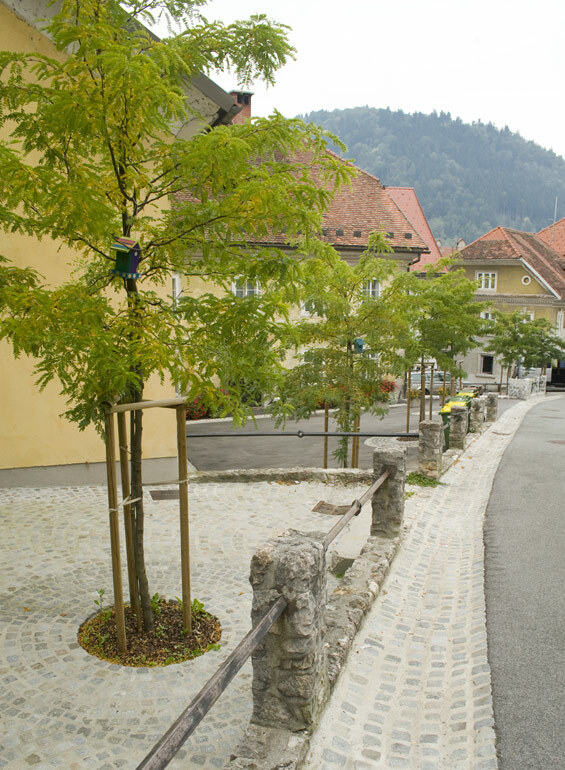 Revival of the old town has been a long-term struggle of the Municipality of Kranj. In 2008 an urban and architectural competition for public space renewal opened up opportunities for achieving a complete and integrated design concept. This project was awarded the first prize and went into realisation. The project followed most important competition guidelines, such as a gradual withdrawal of traffic and creation of pedestrian zones. Before the project followed its realisation, several workshops and presentations with different stakeholders were carried out in order to obtain a broader public consensus. 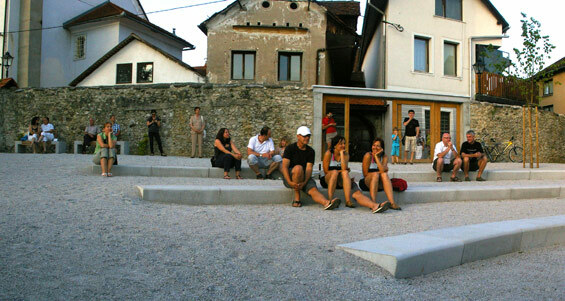 Cooperation between the Municipality, the residents and the designers led to an ambitious idea which added new programs and locations into the overall plan. The proposal was to extend public space areas along the remains of the old city defence system (walls and towers), creating a cultural district with several stage venues and play areas. Design concept is based on a narrative of genius loci, the protective spirit of the place. It reveals a story of its hidden past through allusions of once present highlights that are no longer there. The rich historical context is either recreated or merely hinted. 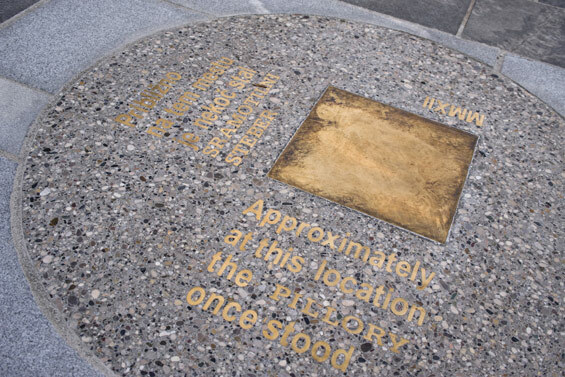 Allusions of the past are captured as pavement indications of archaeological sites, or as new urban elements, indicating some of the most exciting city stories. An inquisitive visitor can follow the history paving map revealing locations of the pillory, the most eminent buildings on the main square, and the remains of Lombard houses throughout the area. 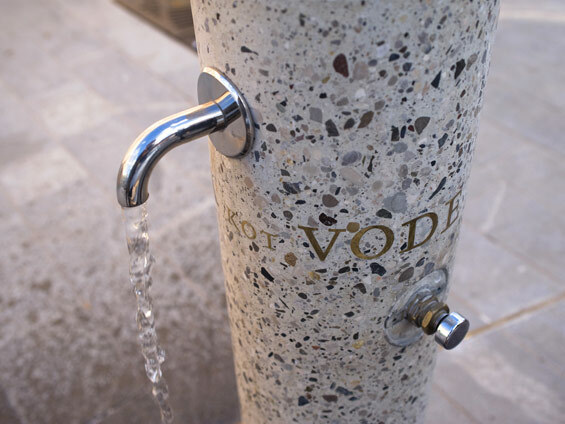 A drinking fountain with an inscription “More wine than water” cites the words of the world known local historian Valvasor, indicating the shortage of water during the Middle Ages. The complete area of historic city centre is unified by underlying paving design, which establishes a hierarchy of open spaces, and corresponds to the typical urban matrix of so called “pier cities” which emerged throughout the region in Middle Ages. In contact with sharp conglomerate rim of the pier, the medieval city suddenly loosens. Densely built structures touch the wild nature of river Kokra on the east, and open outward to distant views above river Sava terraces on the west. City edges reveal two renovated green spaces: Pungart and Khislstein. The word Pungart derives from German “Baumgarten” (orchard), historically situated on the southern tip of the pier. Thus, the area is designed as an empty meadow, and a children’s playground is placed within a grid of cherry trees. 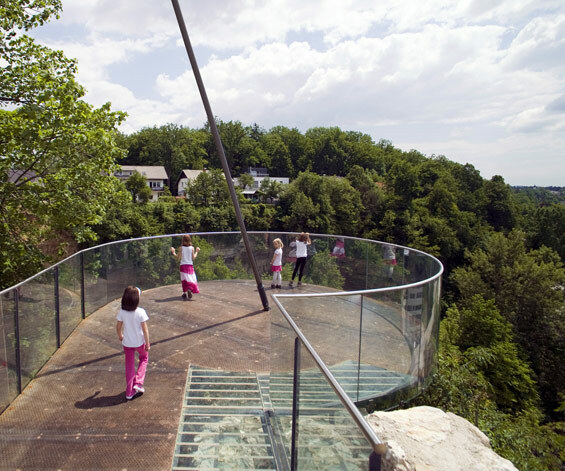 The tip of the pier reveals a dramatic lookout above river Kokra canyon. 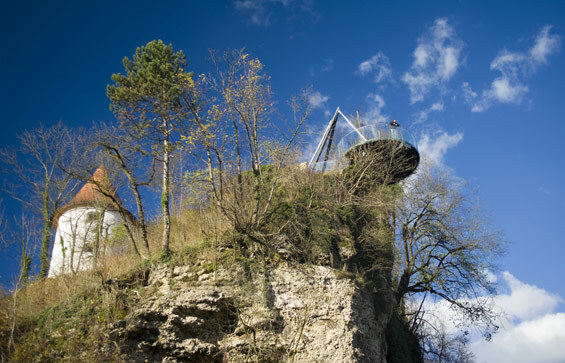 The viewing platform is a symbol of constant struggle between man and nature. It stretches into the void on site and in the shape of a former defence tower which collapsed into the canyon beneath, due to the natural process of erosion. The Khislstein castle garden stretches out on the inside of remaining city walls which define another prominent city edge, depicted in several historical paintings. 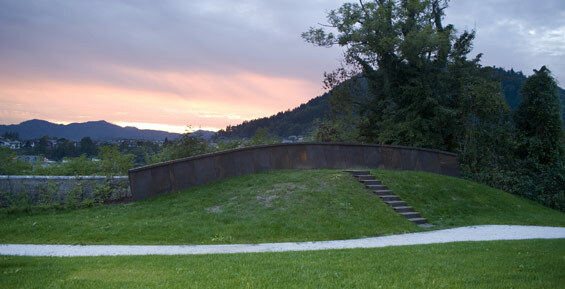 The garden with its extension is designed as a public park with a series of motifs that characterize elements of the defence system of Kranj. The area was extended to a formerly private Vovk garden with remains of another tower. With its transformation from private to public, the tower was designed as a multi-purpose stage venue. 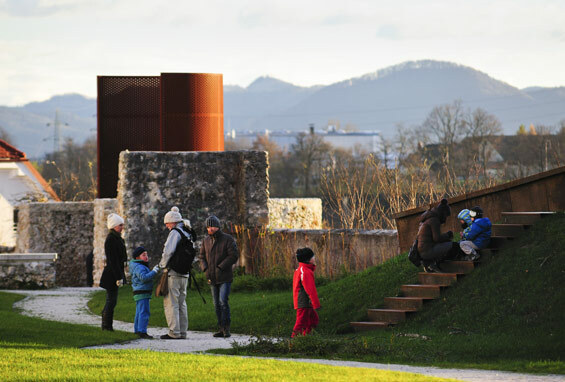 The rotating tip can be turned back or forth to either host public events or to enclose a mysterious lookout area with views through the remaining shooting holes.